The top-three are: 1. Gary Hunt (471.80pts) 2. Jonathan Paredes (450.90pts) 3. Andy Jones (412.90pts). Absolutely no mistake from the Brit!!! Gary Hunt is the winner of the fifth stop of the Red Bull Cliff Diving World Series here in the Azores!!! 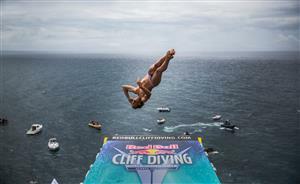 Hello everyone and welcome to updates from the latest stop in the Red Bull Cliff Diving World Series! We're here on the Islet of Vila Franca do Campo, approximately 1,400 kilometres west of mainland Portugal in what feels like the middle of the Atlantic! We've got the best seat in the house for the diving today! We'll begin with the first round in the men's head-to-head which will be off-the-cliff. We're scheduled to get underway at 10.40am local time - be sure to stay right here! 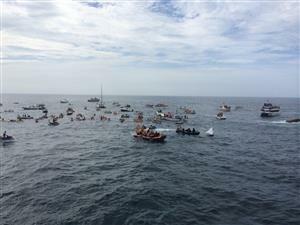 The Azorean public are making their way to the islet! It's almost go time! 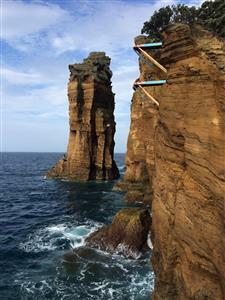 Diving directly off the cliff is a different kind of challenge for the divers. Cliff diving has evolved into a platform sport, meaning the athletes are less used to feeling the rock under their feet. Some are able to cope with the environment better than others! Orlando Duque and Blake Aldridge are well placed to advance from their head-to-heads against Andy Jones and David Colturi, respectively. Remember, we'll be posting updated scores at the end of the round. Steven LoBue has pulled out of the competition due to a hip injury sustained previously. It means Artem Silchenko has already advanced to the final. There’s a new look to the final line-up! Two of the favourites, Orlando Duque and David Colturi, are out and three wildcards are through – Mexico's Sergio Guzman, Ukraine's Anatoliy Shabotenko and the USA's Kyle Mitrione. Next up it's the women... eight fearless ladies will be competing from the 20m platform. Mexico's Adriana Jimenez is in the lead after the two rounds of diving yesterday, and this is the final!